June 22, 2016 June 22, 2016 by Beau H.
Editor’s note: Head here for a host of product reviews on menswear style essentials. A navy twill interior and army green waxed canvas are complemented by leather handles from Wickett & Craig. As luck would have it, it’s been quite some time since our last menswear product review here at The Style Guide. They were a fixture on this here #menswear blog for quite some time, and we’re back today with a review of the Owen & Fred Voyager Waxed Weekender. Past reviews have showcased a range of product, from an essential chambray shirt to a pair of classic chukka boots and beyond. Well, here’s another one — and just in time for summer travel season. In fact, traveling in style could get a whole lot easier if you snag a durable, essential and stylish men’s weekender bag — perhaps one a heck of a lot like the option you see at the top of the page. Yes indeed, this bag has quickly become a big-time favorite at The Style Guide, and it’s accompanied me on a stylish trip to upstate New York, as well as a recent long weekend in Washington, D.C. (thanks to the brand sending it along for testing). Would I recommend picking one up the next time you hit the road? Absolutely. Why’s that? Read on. 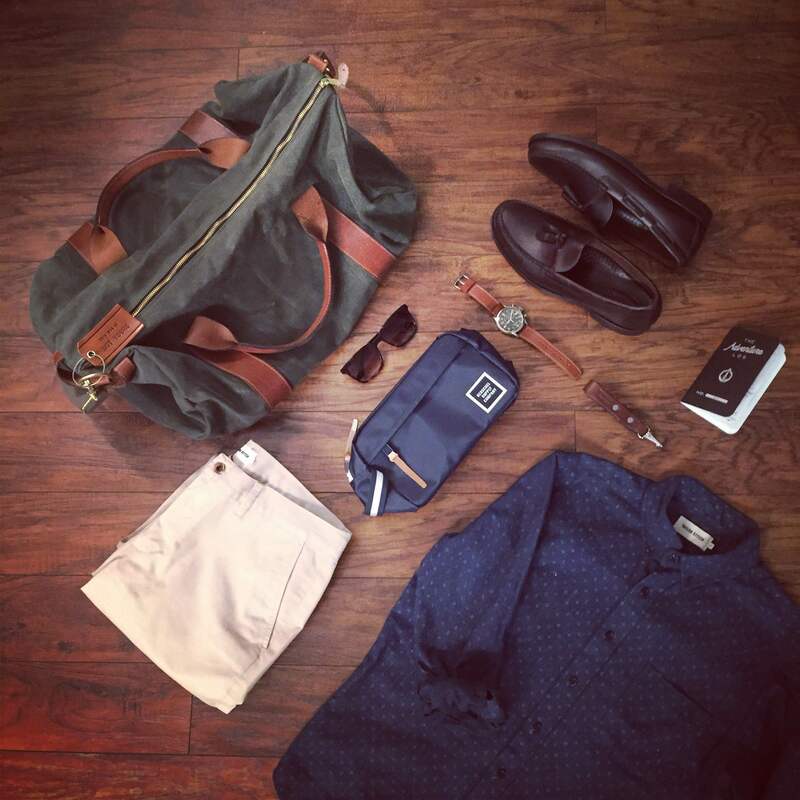 As seen in this site’s roundup of the best men’s weekender bags. Photo courtesy of Owen & Fred. Over time, the excellent men’s lifestyle and design brand Owen & Fred has won me over in a big, big way. They’ve been kind enough to participate in a few Reader Giveaways and provide this site with product for review, and I’ve been a fan of their approach to design even before that. They stock an essential selection of, well, essentials for the discerning guy — be it a sturdy brass bottle opener (a favorite on my Instagram) or larger pieces, like a durable canvas laundry bag (unfortunately sold out). The full product assortment is pretty extensive, yet all designed with refinement and style in mind, and that goes for everything from its shaving kits to intricate wall art. It’s with that approach — great design and quality first — that they’ve crafted the Voyager Waxed Weekender, and it certainly shows. In every situation, from those weekend trips to hopping around NYC, it’s performed very well, and I think that trend will certainly continue. The Voyager Waxed Weekender in tow for a stylish weekend. Chapter Travel Kit by Herschel Supply. Slim Chinos in Light Stone and Jack in Indigo Star Shirt by Taylor Stitch. Heritage Tassel Loafers by Sebago. Leather lanyard by Tanner Goods. Waterbury Chrono by Timex x Red Wing. Adventure Log by Word Notebooks. Maximus Sunglasses by Sunday Somewhere. The specs are impressive and worth noting, for starters. The bag’s tough, rugged and versatile foundation starts with Martexin Original waxed canvas in an eye-catching shade of Army Green. It’s a different look and feel than the typical weekender bag, as that waxed canvas already has broken in beautifully during the production process. (If, on the other hand, you prefer a more luxurious bag, perhaps check out the last option in this site’s post on the best men’s weekender bags). But in this humble style writer’s opinion, that broken-in styling and feel really is a tremendous attribute in terms of looks. That also means the waxed canvas is more pliable than it is stiff, and that’s definitely a good thing if you tend to pack a lot of style essentials for the road, as I did as recently as a Memorial Day trip to upstate New York. That’s yet another box that can be checked off when it comes to the Voyager Waxed Weekender — it’s roomy and comfortably fits two-three pairs of shoes, plus a weekend’s worth of #menswear gear. In the case of yours truly, that means versatile pieces like a slim chambray shirt, dark denim, brown leather chukka boots and indigo sneakers, for example. In comparison to my Navali Stowaway Weekender, it’s got enough room for about a day’s worth of clothes more (that is, an extra set of chinos or denim, plus a shirt and shoes). What all this boils down to are the bag’s dimensions — 22 inches in length and 12 inches in diameter. 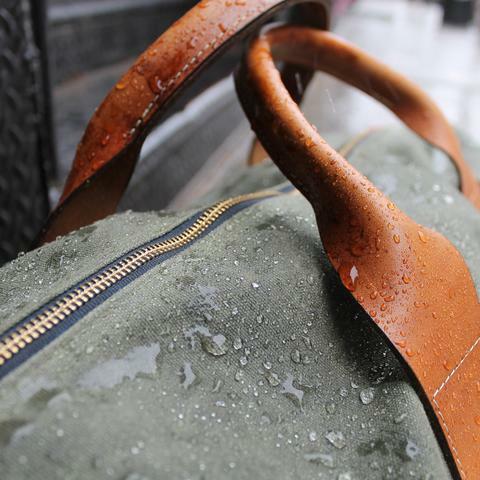 A look at the waterproof qualities of the waxed canvas, plus the beautiful leather handles via Wickett & Craig. Photo courtesy of Owen & Fred. Aside from its plentiful space (including two interior zipper pockets), the bag is finished off with sturdy zippers and brass hardware that shows no signs of stress or giving way. The tightweave (removable) shoulder strap is fairly comfortable, although perhaps some leather reinforcement could be added (that could just be me being accustomed to my Satchel & Page Slim Mailbag, however). Speaking of leather — let’s talk about the detailing on this bag. The 9oz. harness leather straps that finish off the Voyager Waxed Weekender on the handles and at the strap are coming at you via Wickett & Craig , one of the oldest tanneries in the country. That attention to detail shows, as these handles are soft and supple, yet sturdy enough to support a fully-packed bag. They’re also rich in color and contrast nicely with the waxed Army Green canvas (although this bag is also available in Charcoal). 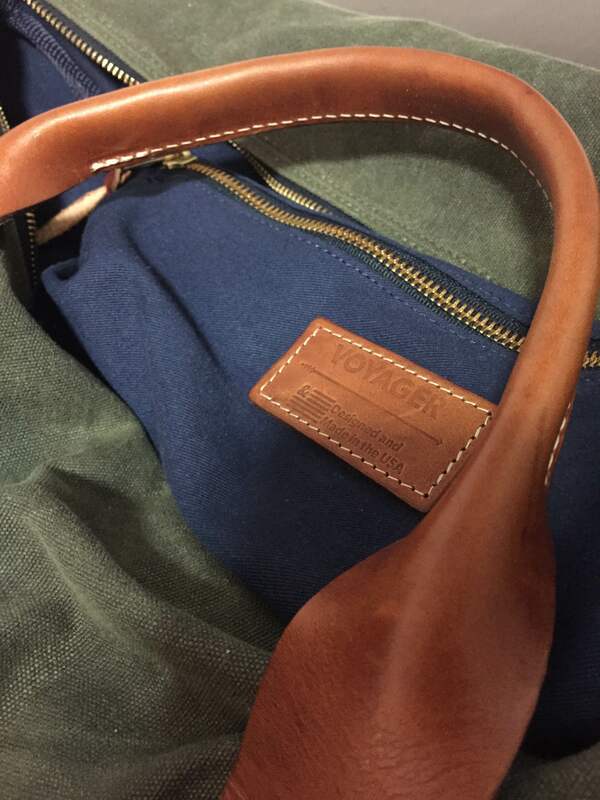 And down onto the navy cotton twill interior, this bag is something else. It’s a work of art — practically — that should carry everything you need for a stylish weekend away and beyond. It’s got a rugged-refined appeal that’s unique, eye-catching and classic, all at once. Whether you carry it alongside slim stone chinos and an indigo shirt, or stylish summer shorts and a pocket tee, it’s going to add plenty of practicality, function and classic style to all your summer adventures. Get your own Owen & Fred Voyager Waxed Weekender now. February 29, 2016 November 27, 2016 by Beau H.
Editor’s note: For product review on watches, boots, bags and everything #menswear, click here. It can sometimes be surprisingly tough to find durable style essentials. That is, the type of piece you can wear over and over again thanks to its quality, reliability and yes, style. While there are a plethora of options out there for these types of things, from endless varieties of dark denim to great leather sneakers, how do you know which style or size or cut is right for you? That’s where Todd Shelton comes in — to take care of that guesswork for you, at least on the shirting front. You might be familiar with the brand — and this very shirt — from its inclusion in our Style Pick of the Week series, but we’re here today to go just a bit more in-depth. Why should that matter to you, my discerning menswear fan? For starters, the brand is all about the kind of style essentials this site (AKA yours truly) writes about in droves. For another, they’re a company that knows where its allegiances are forged — like a good number of stand-up, standout brands these days, that’s right here in America. And they sure do know how to craft a heck of an essential chambray shirt. The chambray shirt on its own — a slim fit and nice texture to the fabric make this shirt a keeper! That’s definitely what makes the brand worth a look — the knowledge and intuition to stick to doing great basics very well. And if you’re wary of ordering a chambray shirt like this one online, fear not. In fact, that’s a highlight of this review process. When the brand initially reached out to me late last fall, I myself was a bit skeptical of ordering sight unseen. However, that’s where Todd Shelton’s ingenious Fit kit comes in remarkably handy. You can either choose from basic fit options (which include the rarely found Small/Medium, Medium/Large and so on), or register for the Fit Kit. Once you fill in some basic customer information, a kit is shipped out to you containing what you might call a test shirt. You try on said test shirt and follow their instructions to record your measurements, before sending the test shirt and the aforementioned measurements back to the brand using a free return label (again, another small key that makes a big difference). The customizations even go so far as to include Stomach Taper, Sleeve Taper and options to add on a pocket. And after all those boxes are checked off, you get a shirt sent back to you within a matter of weeks, completely customized and, in my case, exceptionally well-fitting. It’s the little things like that — plus the big things, like made-in-America production — that warrant the higher price tag. And yes, $200 is a steep price tag for a shirt if you’re on a budget or want to spend less on clothes this year. But as always seems to come up, compare that price to what you might grab at some place like H&M — three or four or heck, five times over. That’s the silver lining, my friend. Just one way to style this shirt. Charcoal blazer by UNIQLO. Floral pocket square and brown leather belt by J. Crew. Red knit tie by 15ties. Navy suede 1000 Mile Boots by Wolverine. Striped socks by American Trench. Now as to the shirt itself. The Natural Chambray fabric has excellent texture to it, and the flecks of white in the fabric help differentiate it from a classic blue Oxford shirt. This makes it a little more rugged and unique-looking, but just because there’s some texture to the fabric doesn’t mean the shirt is scratchy or uncomfortable to wear. In fact, it’s soft and breathes fairly well for a chambray shirt. I went with a slimmer fit all-around, and it fits like a charm. The armholes are high and the sleeves and shoulders are trim but still comfortable. Be advised that if you do choose the Short length in terms of the shirt’s hem, it is indeed a tad on the short side (but again, that’s likely the result of human error from yours truly). In terms of other looks, the white buttons make it a bit dressier than the black buttons on my GAP chambray shirt, so it can be worn a bit more easily with a wool blazer. The versatility of this shirt means it’s great for travel, too. Mt. Drew Duffle by United By Blue. Chocolate Suede Scout Chukkas by Thursday Boot Company. Adventure Log by Word Notebooks. The light blue color also makes it the ideal contrast to slim dark denim and a shawl-collar cardigan — perhaps one of my favorite ways to wear the shirt, as you can see at the top of the page. It can also be layered with ease over a white henley for a vintage-inspired look. And the color stands out well with some slim tan chinos, too. My guess is that it can also pair just fine with some great spring or summer shorts when warmer weather does roll around. So it really is a true four-season chambray shirt, as the texture and the nice roll of the buttondown collar help it stand up to beefier sweaters and dark denim during the fall and winter. When it finally does warm up, there’s plenty of potential to wear it with all kinds of outfits, as well. The bottom line is that if you’re initially on the fence about dropping a lot of cash on this shirt, think of it as a great investment (and it can be made even more versatile if you pick up the point-collar option). Plus, it’s not often you can team a made-in-America shirt with everything from khaki shorts to grey chinos and still stand out for the right reasons. Get the Natural Chambray Shirt from Todd Shelton here. Do you own anything from Todd Shelton? How would you wear and style this chambray shirt? February 22, 2016 February 17, 2016 by Beau H.
Editor’s note: Click here for a plethora of product reviews on the right kind of gear to pack in your bag. P.S. Do you like The Style Guide on Facebook? Taking the Mt. Drew Duffle from United By Blue around the country. Leather luggage tag by Owen & Fred. The more you travel, you more you realize that it just pays to have the right gear. That goes for simple, smaller things like your toiletries kit, all the way on up to the right pair of shoes or sturdy outerwear. It goes without saying then, that the bag with which you transport all this gear is pretty essential. And like other considered areas of your outfit, a great weekender bag can add a solid, reliable touch to your travel ensemble — seriously. It’s an area that should be overlooked, so when you find one that gets the job done, you should hold onto it. I’ve been traveling quite a bit in recent months, from a Christmas trip to Florida to a work trip to Utah, and a nice bag has proven critical to get from point A to point B. With that being said, the United By Blue Mt. Drew Duffle that you see here has been more than up to the task of handling all of my style essentials. Ready to hit the road with the Mt. Drew Duffle. Natural chambray shirt by Todd Shelton. Chocolate Suede Scout Chukka Boots by Thursday Boot Company. Adventure Log by Word Notebooks. United By Blue should be a familiar name if you read this blog regularly — they’ve popped up in our ongoing Style Q&A series, and they craft everything from the duffle pictured here to responsibly made shirts, henleys and swim trunks. And as with any purchase, you can feel great about picking it up — they remove one pound of trash from oceans and waterways for every product sold, and they bring along their employees as volunteers to do it. So it’s no ordinary company you’re buying from, and that’s a very good. Namely, it means the quality and craftsmanship of this bag can stand up to the commitment they’ve promised. And it means that no matter which of the five available colorways you pick up, you’ll be getting the same quality (for the record, I ended up going with the Moss option). Brass hardware pairs well with the dark brown genuine leather straps. The waxed canvas should hold up quite well, too. If you’re going to be lugging this around the country as I’ve been, durability is going to be crucial. Luckily, the 18oz. organic waxed canvas is a huge plus — the bag has so far stood up to being jammed in overhead compartments and carried around on the subway, and it hasn’t shown any signs of ripping or giving out (pretty critical with how much gear I’ve packed into it at times). Now, it’ll certainly see lots more use going forward, but initial signs are quite promising. Another big aspect of that durability component is the hardware, as you can see from the above photo. The brass hardware teams nicely in terms of aesthetic with the genuine dark brown leather, but it also feels quite sturdy when picked up, too. That is, it doesn’t feel like the leather handles are going to give way on you, or like the shoulder strap (also padded with that dark brown genuine leather) is going to suddenly break off. These are all big bonuses, and signs you should check out right away when grabbing your own bag. The leather handles, while sturdy, aren’t too stiff to carry the bag with — while the leather isn’t buttery-smooth, with repeated use, they’ll stand up to carrying while looking quite nice. So overall, this bag definitely has solid durability going for it. Enough space for two pairs of sneakers side-by-side (plus gear not shown). Fit to carry all kinds of seasonal accessories. Leather luggage tag by Owen & Fred. Buffalo Bobber Leather Gloves by Iron & Resin. One drawback might be that if you like things ultra-organized inside your bag — that is, divided up by compartments or sections — this bag doesn’t quite have that. There is an interior zipper pocket however, but that’s it. But given the bag’s roominess, I’ve always found that my gear fits in comfortably without things getting too jumbled up. As with any accessory you’re going to be bringing with you lots of places, looks are absolutely key, too. 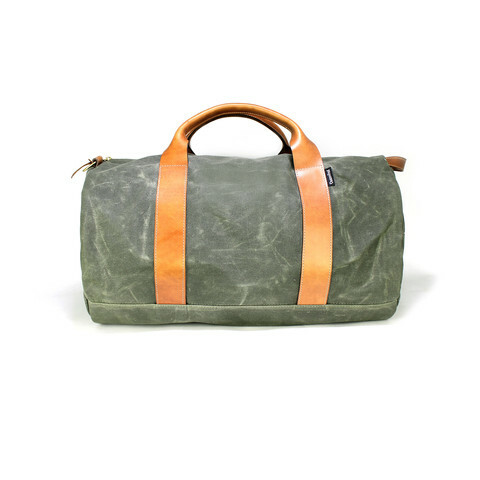 I’ve found the rich Moss color of this weekender to be a neutral complement to all sorts of travel outfits (again, style’s in the details!). It strikes the right balance between being unique yet not too outlandish. Any of the five other color options currently available would do much the same thing — particularly the rich Nutmeg color or the handsome Chocolate color. The lighter shade of tan even calls to mind a Filson bag. Which brings us to a key differentiator between an expensive weekender and this one — price (not too hard to figure out there, ehh?). For a bag of this quality and styling potential, the price is just right. That’s particularly true when you consider that the Navali Weekender runs about $30 more expensive. It’s critical that this bag provides more space, more color options and a thicker waxed canvas (not to be overlooked when searching for something long-lasting). Keep in mind that if you were looking for something more smaller and more like an overnight bag, J. Crew Factory is currently offering up its Carson Duffel Bag for just $68.50. And on the slightly more casual front, J. Crew’s Harwick Weekender Bag is going for $148 (but that piece features nylon versus waxed canvas). Were you to go for something on the pricier side of things — like a true Filson weekender — know that the price is going to hop up significantly. So when it comes to combining craftsmanship, quality and price with the right kind of looks, it’s tough to go farther than this United By Blue Mt. Drew Duffle. The Moss color in particular is rich and eyecatching, the hardware is solid and well-crafted, the leather straps and detailing will break in nicely over time, and the price is on-point for what you’re getting. Heck, you might yourself making more excuses to use this bag than you thought. Do you own the Mt. Drew Duffle from United By Blue? Or is it on your Wish List? February 15, 2016 February 6, 2016 by Beau H.
Editor’s note: For a full set of product reviews covering everything #menswear — from watches to chinos — click here. Getting out and about at the High Line in NYC with the Thursday Boot Company Color No. 8 Diplomat Boot. Slim tan chinos by Banana Republic. Striped henley by J. Crew Fisherman Cardigan by JackThreads. Merino watch cap by American Trench. Buffalo Bobber Leather Gloves by Iron & Resin. Glasses by Warby Parker. If you peruse the pages of this blog from time to time, certain brands definitely tend to pop up consistently for their mix of affordability, dependability and, in the case of Thursday Boot Company, seasonality. That is to say, in the depths of winter for a lot us, you need sturdy, tough footwear that can carry you through slush and snow to your car (or the subway), and then wherever the heck else you might need to go — be it a concert, a date, you name it. So that’s what we’re looking at today. The brand’s boots have been featured here prominently before, including a review of the Chocolate Suede Scout Chukka and the dearly departed Roughout Captain Boot. First launched as a Kickstarter project not even two years ago, the brand continues to make splashes with well-timed and well-executed releases — including its more premium Black Label line and unique silhouettes like the hiker-inspired Commander. But one boot in particular is the focus of today’s post — the Color No. 8 Diplomat Boot. The silhouette definitely calls to mind the classic Red Wing Heritage Moc Toe Boot, yet the Thursday iteration is sleeker and more refined. There’s something to be said for that, despite the fact that it’s a moc toe boot. This pair forgoes the classic yellow laces in favor of sleeker flat-wax laces, just as the Roughout Captain Boot. And the sleekness and quality of this pair for the price is evident as soon as you get them out of the box. Looking for a boot that’s just different enough than a captoe boot or a chukka boot — yet still versatile and sufficiently sharp — is a somewhat tricky endeavor, but these boots fill that void nicely. Unboxing the Diplomat Boot from Thursday Boot Company. Big fans of these guys. Crucially, they make use of renowned Horween leather in that covetable Color No. 8 shade that’s popped up on everything from boots to watch straps in recent years. The change of pace from a roughout leather or a dark brown or black boot is refreshing, yet it’s not as distinctive as, say, a Dr. Martens Boot. That’s a very good thing — these look sporty thanks to the ridged Vibram Christy sole, yet I still found they paired comfortably with tan chinos and a striped henley for exploring around Manhattan. I did find (and I’ve found with other boots in this style), that the leather breaks in easier than other leathers — and because of the shine of this pair, it shows creases more easily (as you can see below). However, it’s nothing some well-timed leather care can’t fix, and it definitely doesn’t detract from their wearability. Lining them up after a few weeks of wear. With some care and treatment, the Color No. 8 Diplomat Boot should hold up just fine. 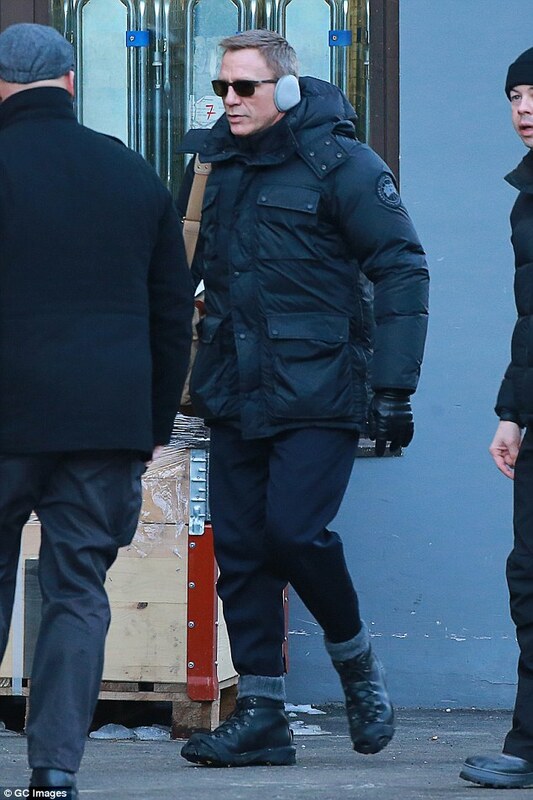 That’s another area in which this pair of boots excels — the versatility, erm, department. I’ve broken them out with a slim chambray shirt and a wool blazer, and I’ve rocked them with the aforementioned tan chinos, too. A trim pair of denim breaks just right on the bend of the boots, making for a pretty sleek look (something that can help everyone out). I could definitely see them working well with some wool trousers and perhaps a navy crewneck sweater on a more casual day at the office. The burgundy color would also pop nicely with some trim black denim (more on that later this week), and they’re going to fit right in with lightwash jeans in the spring, too. One of two other options in the brand’s Diplomat silhouette, this one made out of Natural Horween leather. The white ripple sole might cause some to shy away from these boots — after all, it’s different than what we’re normally accustomed to seeing in the way of boots. But that again makes it a nice style move. It’s not as if these boots are absurdly priced, so if you’ve been looking to try something different, this is but one way to go. The Diplomat line also features a pair of Natural Horween leather boots with a Goodyear-welted sole, and a pair in Brown leather. So, the Color No. 8 pair is just one way to make an impression. And yet, it’s the pair I’ve found myself gravitating toward the most. Thankfully, the other details work out as promised. The eyelets and laces have held up well trekking through the Brooklyn snow, although the lack of extreme traction could be a bit tricky in some instances. However, the Vibram sole is also as comfortable as advertised, even when worn for long periods of time. They run true to size, so there was no slippage (or cramping up of my feet, conversely) with some striped socks. Some have had issues with stitching imperfections or other problems around the sole, but there were no major problems with this pair — again, one reason why it’s worth it to pony up for a pair of these as opposed to something from, say, H&M. They’re nice enough that if you were feeling adventurous, you could rock them with a slim grey flannel suit and a chambray dress shirt. Make sure you nail the break of those trousers and you’re all set. And that’s about all you can ask for from a sub-$250 pair of boots, especially ones made from Color No. 8 Horween Chromexcel leather. From chinos to jeans to wool trousers, they can do it all. Even on days besides Thursday (see what I did there?). Have you tried out some boots from Thursday Boot Company yet? How would you style this pair? January 25, 2016 February 4, 2016 by Beau H.
Editor’s note: For product reviews on outerwear, shirting, accessories and beyond, click here. Portions of this article use affiliate links, from which a small commission might be earned. The Style Guide only recommends and reviews products its editor loves and wears regularly. A sharp blue dial and crisp markings make this MVMT Watches timepiece a keeper. The finishing touch that a watch can bring to an outfit is one of the small pleasures of the menswear world, in my mind. Throwing on a reliable and stylish timepiece day after day can become a nice sort of repetition — on days I’m not wearing a watch, it feels a bit like I’ve lost my totem. Whether that’s the case for you and you find yourself with a growing watch collection, or you’re just diving into the world of watches, looking for style and versatility with a budget in mind won’t let you down. Luckily for both the novice and experienced watch enthusiasts among us, a growing group of companies are riding the digital #menswear wave to put out watches that are stylish, affordable and reasonably well-crafted. Now, you won’t be getting a Patek Philipe from some of these brands, but that’s not what we’re going for. And among that set of brands producing sharp watches at excellent prices, MVMT Watches stands out. The brand offers a variety of styles, including its simple-yet-slightly futuristic Classic line, and a series of Chrono watches that are a little more eyecatching — but the real pieces of interest (at least to yours truly) come from its 40 Series. The dials in the collection lean dressier thanks to the slim silver seconds markers, and the combinations — from rose gold plus brown leather to a silver dial with brown leather — are refined and yet easily wearable. With that being said, the brand was a new one for me before they reached out and were kind enough to offer this watch for review. I was admittedly a bit skeptical having not heard much about them (although their Instagram following is substantial). But after rocking The 40 – Silver/Brown Leather for the past month or so, I can safely recommend it as a bargain pick-up that wears a heck of a lot nicer. The storage case is also a nice added touch from MVMT Watches. The first standout quality about this watch is the color of that dial — I was initially a bit worried at how much I’d be able to wear a watch with a blue dial (we all know how much I love blue). But the rich dark brown leather of the strap, plus the slightly toned-down silver case markings, make this watch more versatile than, say, a blue strap and contrasting red dial markings might make it. In short, I’ve paired it as a complement to dark denim and navy chinos, and I’ve even paired it up alongside navy suede boots. So when worn in the right situation, it can add a nice complement to ensembles that at first glance might not work. And it’s to the credit of this watch that the durability surprised me even more than the style potential. The blue dial lends itself surprisingly well to pairing with rich style staples like tan Chelsea boots (from ASOS) and an elbow-patch sweater (from JACHS NY). The great thing about this watch is that the dial should hit the sweet spot for a lot of us — similar to a brand like Daniel Wellington, a 40mm case diameter is decently big enough so as not to look too small on a larger wrist, and it does just fine in terms of standing out on a small-to-medium size wrist (who knew wrist size would come up so frequently here?). That’s where The 40 – Silver/Brown Leather falls on this spectrum, and it’s built to be worn with everything from suit trousers to a striped henley and cardigan. Crucially, the silver-plated stainless steel case feels fairly durable when wearing it, too — this isn’t a watch that feels too light on your wrist, or as if it can’t take a bump or two. Now, this isn’t a rugged dive watch, but the case is certainly thicker than a Daniel Wellington timepiece. Another must-have when starting the day, besides a great watch — delicious coffee! Brew shown here by Blue Bottle. That extra thickness helps it wear a little more casual than a standard dress watch (although DW’s watches can be dressed down, too). The dark brown genuine leather strap doesn’t feel cheap or flimsy, and it’s worn pretty solidly throughout the past month — again, that’s a positive for the price. And if you’re the type who doesn’t like the “tick, tick” sound you get with some other watches (lookin’ at ya, Timex), rest assured, the 40 in Blue/Brown Leather runs smoothly. It’s also water-resistant, so that should add another layer of protection to this watch. As far as other details, it boasts a quick-release feature at the buckle for the brown leather strap, so a new NATO strap could be swapped in with ease. The final selling point with this timepiece revolves around, as it seemingly always does — price! MVMT isn’t charging an arm and a leg (or a couple wrists) by any means. While this isn’t Timex-level pricing, $120 is still an excellent price for a watch that can carry you through at least three or four different outfits a week (as I’ve found) — and that goes for sharp situations that call for Chelsea boots (as seen above), to more casual weekend days. A blue dial could be an interesting style plunge to take if you’re just getting into watches, but it could definitely pave the way for future purchases if you wear this timepiece with confidence. And that’s what a great watch should ultimately give you at the end of the day — confidence. And oh yeah — the power to be on time to that lunch meeting. What do you think of MVMT Watches? Would you consider buying a blue-dial watch?